Congressman Adam Schiff and NASA astronaut Tracy Caldwell Dyson take a photo with students at La Crescenta Elementary. LOS ANGELES — NASA astronaut Tracy Caldwell Dyson shared her experiences on the International Space Station with elementary school students in her home state on Jan. 23. "Can you tell I really like being an astronaut?" she asked the third, fourth and fifth graders of La Crescenta Elementary in California. And they answered with a resounding, "Yes!" The discussion began when a student asked her what inspired her to become an astronaut. It was a mixture of her parents asking her to list what she wanted to do (she enjoyed studying science, working with tools and learning to speak another language) and of inspiration resulting from Christa McAuliffe, the first teacher chosen to go to space on the Challenger in 1986. In honor of Dyson's visit, Congressman Schiff presented a flag to La Crescenta Elementary principal Kim Bishop. The flag was previously flown over the United States capitol. Caldwell Dyson showed a video that detailed her time at the International Space Station. It included her shuttle launch, exercising, eating sushi, doing experiments, making repairs as well as having fun with the team on board (hide and seek, singing and participating in space shuttle Olympics). There was audible wonderment when the video showed water in an open plastic sandwich bag and how the water remained in the bag when it was turned upside down. This was one of the "Kids in Micro-g" experiments where kids across the country develop experiments that get performed on board by astronauts. Caldwell Dyson told the kids that she hoped some of them would participate in the space program; it's where they could use their talents and gifts. She explained she worked really hard in the space program because she believes in it. "I believe that we as a country and a world need to keep exploring space," she said. "My experience, because of my age and where we are with our space program, I'm probably going to only see the lower orbit of Earth. My experience is going to be circling around the Earth." She asked the students where they thought space exploration would advance to when they're her age. Among the responses: Another galaxy, Jupiter, Mars, and biggest world in the universe. 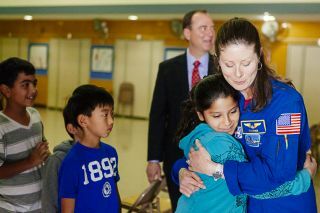 Every year Rep. Adam Schiff (D-Burbank) invites an astronaut to visit schools in his district. Dyson is the eighth participant. In honor of Dyson's visit, Congressman Schiff presented a flag to La Crescenta Elementary principal Kim Bishop. The flag was previously flown over the United States Capitol.